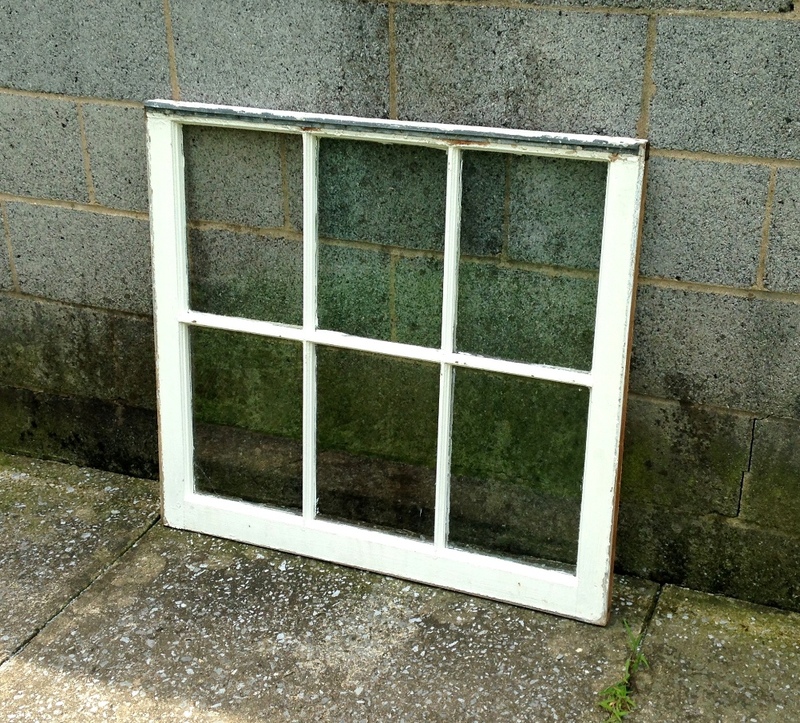 An old (possibly 100 year old) window salvaged from a neighbors renovation project. Step 1- Start with a clean piece of glass. Any glass will work for reverse painting as long as it is THOROUGHLY clean- if there is any grime or grease on it the paint will eventually peel off (if it sticks at all). 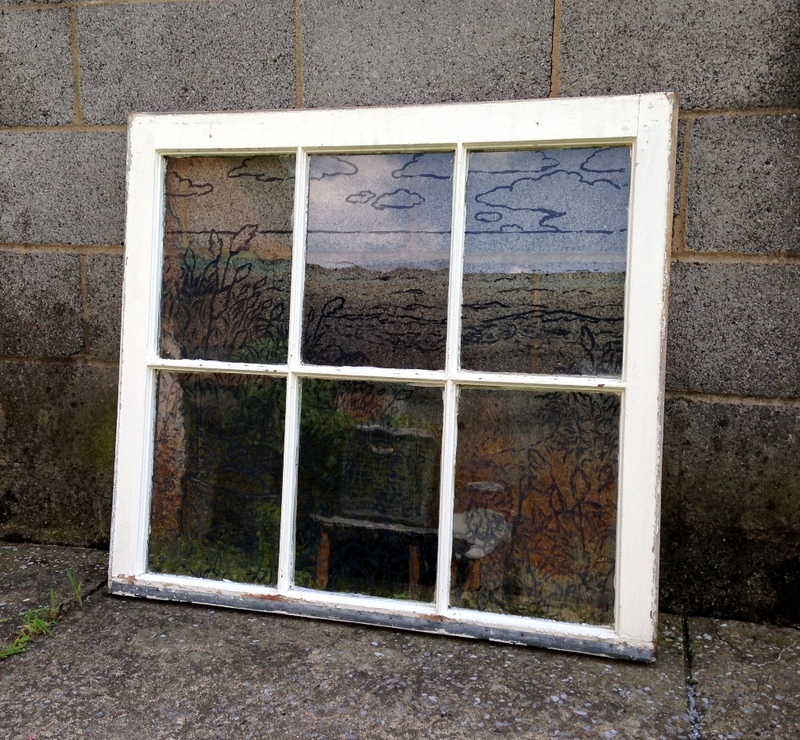 I used an antique window and spent almost an hour scrubbing all the peeling paint and crud off of it. As a final “rinse” I wiped each pane with rubbing alcohol. If your using old windows you may want to wear gloves and a mask to prevent exposure to lead paint (which I am sure was what this window was plastered with). You may want to wear gloves while you are painting to avoid getting fingerprints on the glass- since the oils on your skin will interfere with the paints adhesion to the glass. A cartoon has been placed face up on the side of the glass that will be painted on. Step 2- Do a little planning. 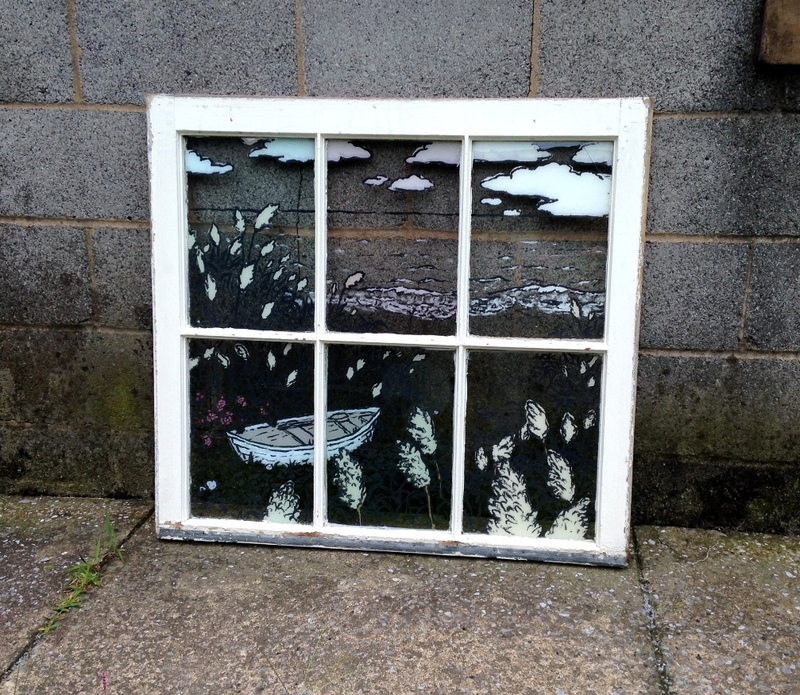 Since you will painting front to back (in reverse) on the underside of the glass you may want to do a quick mock-up. 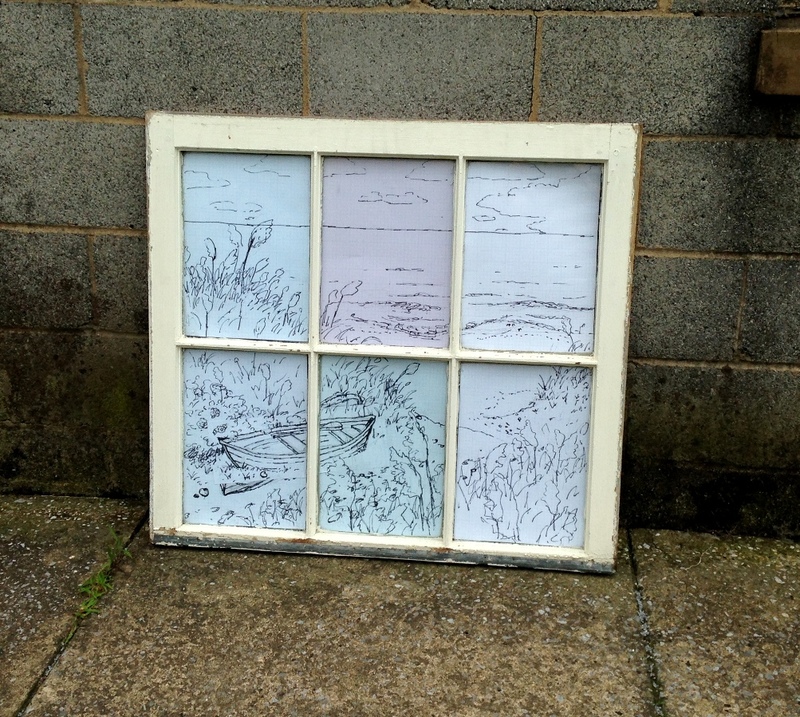 I drew up a cartoon on tracing paper, cut that up and placed a section in each pane on the back side of the glass. Then I traced the cartoon onto the front side with a marker. Note that each pane of glass has a different hue (the top center piece is almost rose tinted) and probably came from a different source. The outlines have been painted in on the underside of the glass. Step 3- Paint in your foreground. In reverse painting you are working from front to back as opposed to the usual back to front. In my work there isn’t necessarily a foreground as much as heavy, cartoonish outlines- so I started with that. I then scrubbed off the marker I used to trace the cartoon onto the front side of the glass to avoid confusion later on. The highlights have been painted in. Step 4- Paint in the mid-ground. 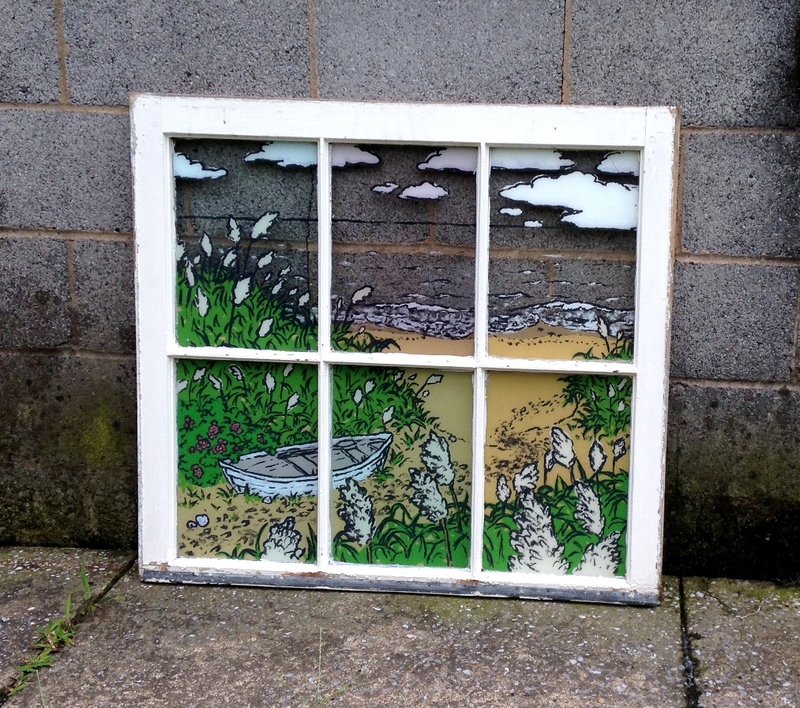 With this piece the mid-ground ended up being the highlights, sand and vegetation. Notice how the tint of the glass influences the color of the paint underneath especially in the top center pane. 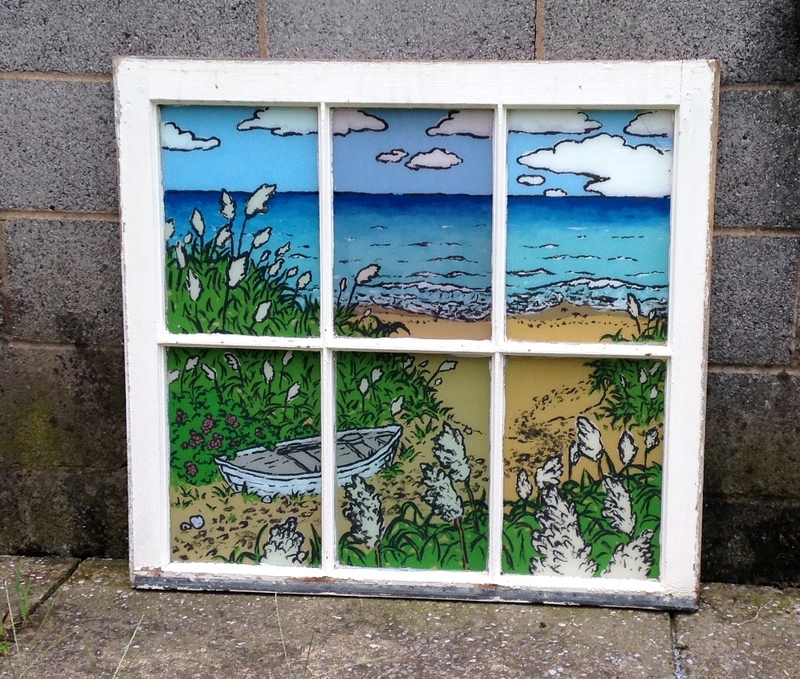 If you use even lightly tinted stained glass it can have a dramatic effect on your painting. With the sea and sky painted in this piece is essentially complete. Step 5- Apply the finishing touches. Finish with the background- in this case the flat, bright, cerulean blue of the sky. It is possible to do blending in reverse painting-like I did with the turquoise and dark blue of the sea. I used acrylics so I just had to work very quickly. If you use oils (or Open acrylics) it’s easier to blend but the paint takes a lot longer to dry. Once painting is complete I would let it cure for at least a week (with acrylics) before sealing it up with varnish or top coats. If you are using oils you will need to let it cure for a long time. For this piece I am going to coat the back with a white enamel to block light from coming through and make it completely opaque. Then it will be varnished and waxed to protect the painting. 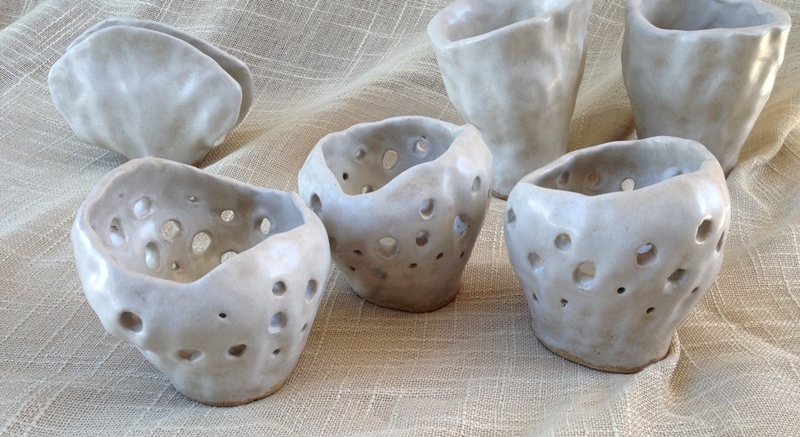 For this porcelain luminary I applied a layer of Nutmeg Glaze to the outside and then top-coated that with several layers of white- they melded beautifully. 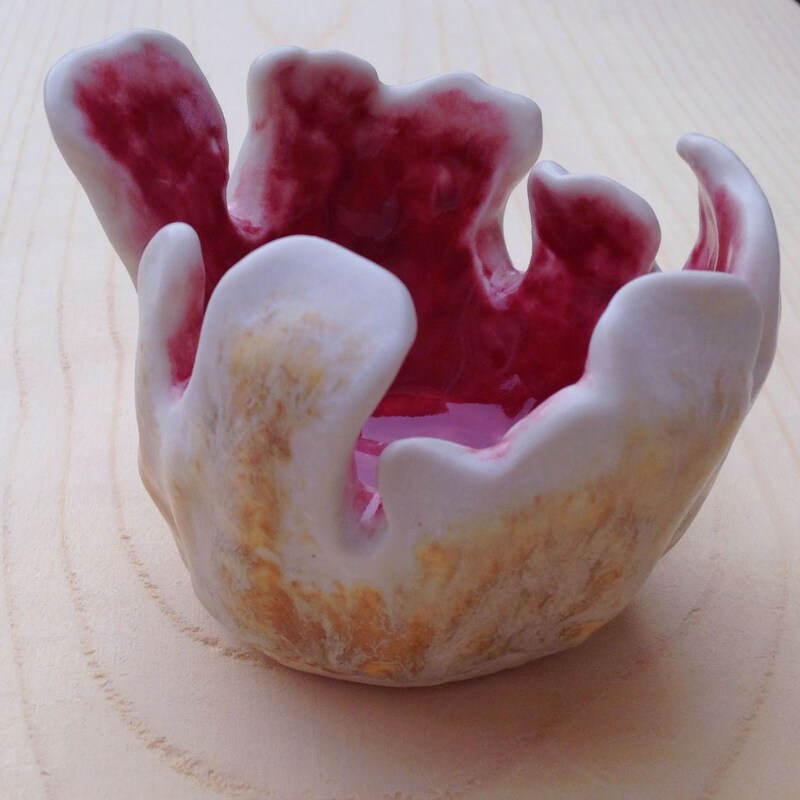 In the interior a applied several layers a translucent burgundy glaze and then applied a layer of clear along the edges which created a very smooth transition. 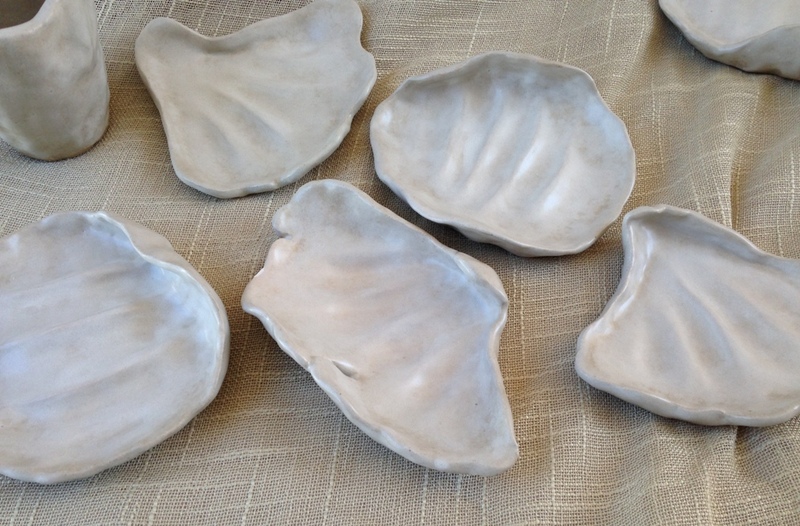 These free-form sculptures took on a variety of oceanic forms- Seashell shaped soap dishes, primitive sea sponge like goblets and vases and leafy, algae like platters and luminaries. 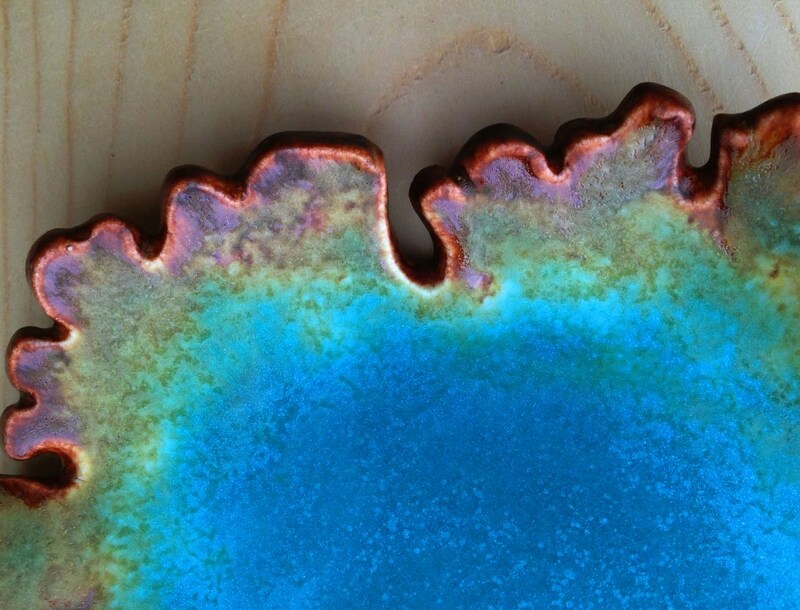 With the glazes I experimented with mottled, oyster shell finishes and smooth transitions from areas of clear glaze into patches of intense color. 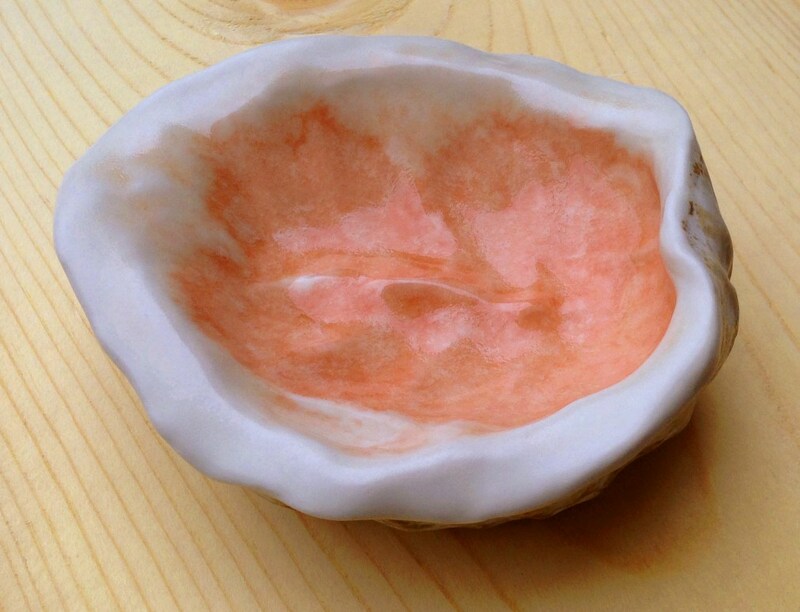 For this seashell-like soap dish i glazed the interior with a shell-pink Peach glaze, and then top-coated that along the “lip” with layers of Satin Clear glazes- than transition came out perfectly. Note the slight ridge on the bottom to keep the soap from sticking. 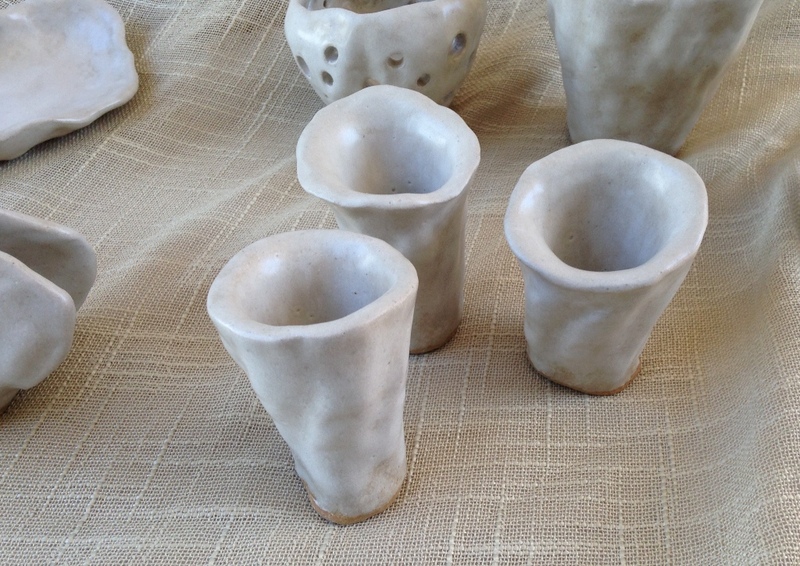 On this little shot glass/ mini vase I created a mottled oyster shell-like finish with a combination of Temmoku and Satin White glazes. on the interior I applied several layers of Lavender. 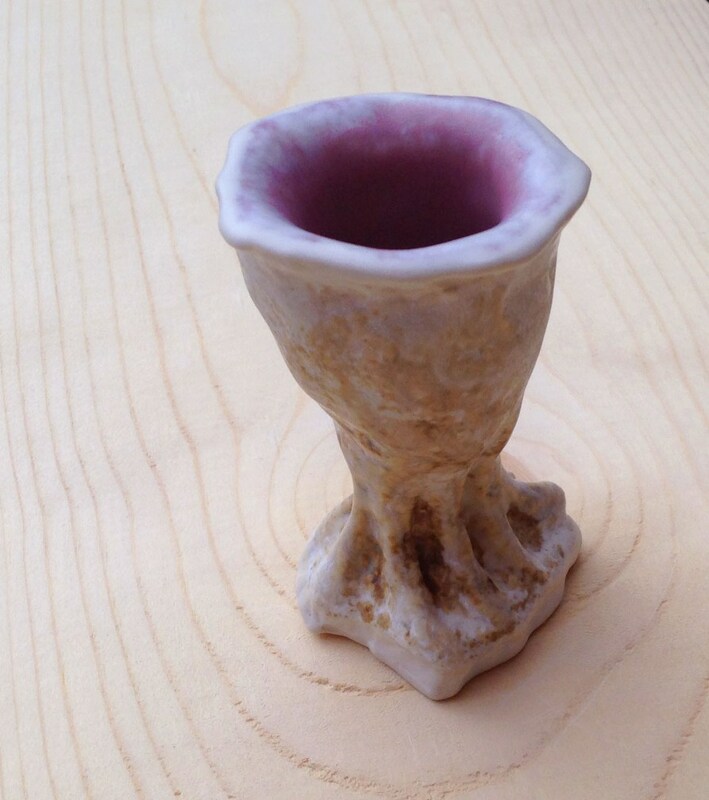 The shape of this miniature goblet reminds me of some primitive sea sponge. 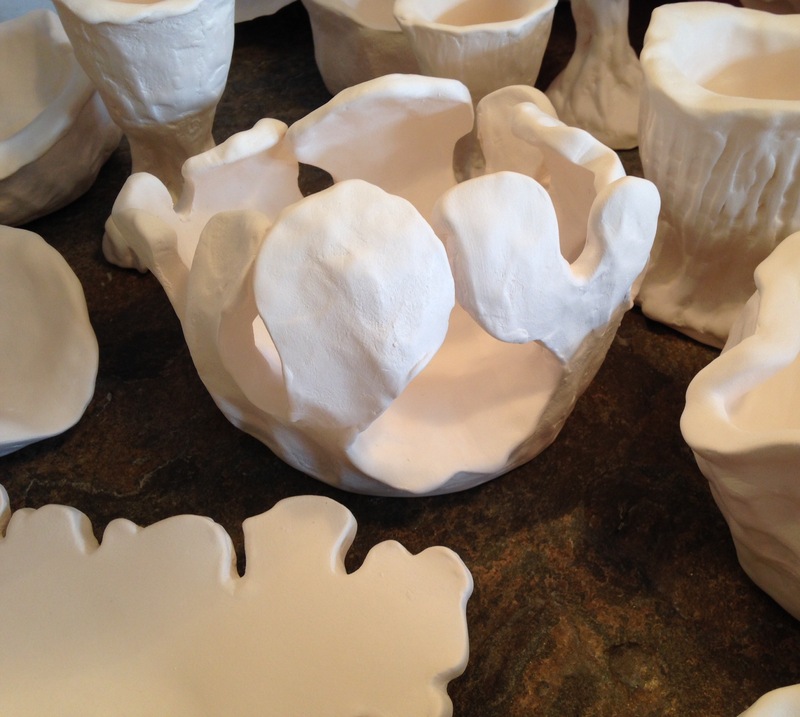 With this leafy luminary I applied layers of Satin White glazes over a layer of Nutmeg- which created a sea shell like finish on the outside. 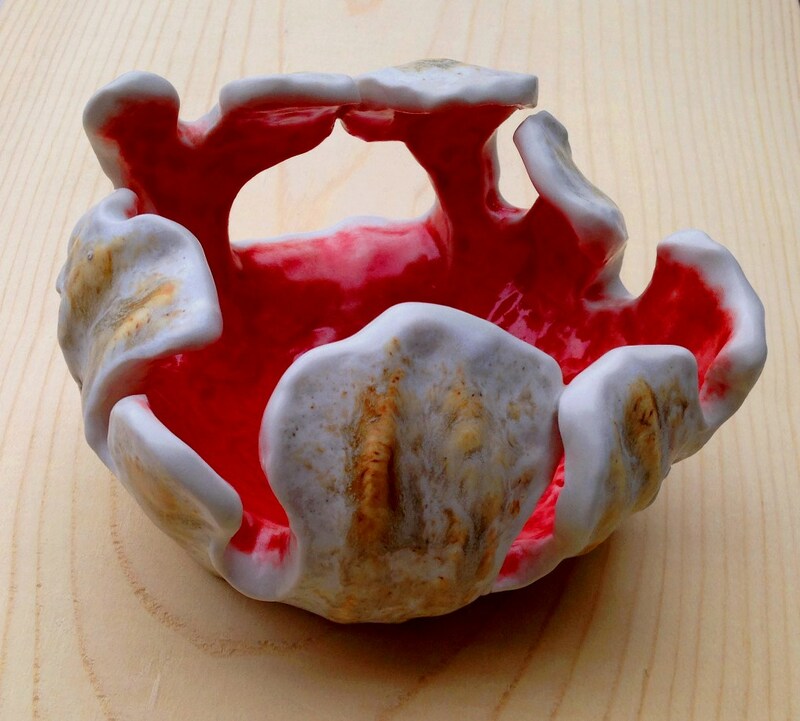 The interior was coated with an intense, translucent coral glaze. On this platter I applied Nutmeg and Temmoku Glazes along the sides and edges of the top and then I applied several layers of Turquoise to the top/inside. The final effect look like the aerial view of some tropical lagoon. On this business card holder I applied an opaque white glaze over splotches of Temmoku on the outside for a mottled oyster shell effect. 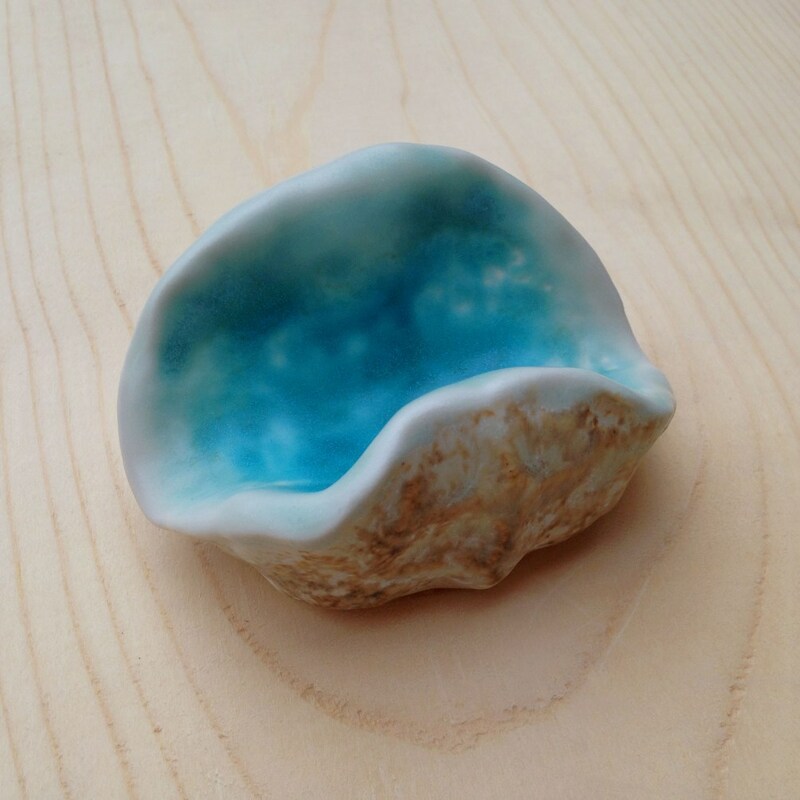 on the inside I painted several layers of turquoise and top-coated the edges with a Clear Satin glaze. 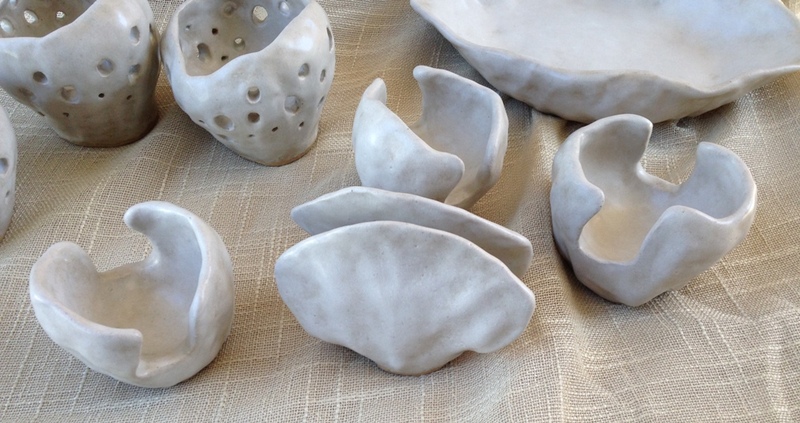 My first batch of porcelain “sea forms” survived their first trip through the kiln. 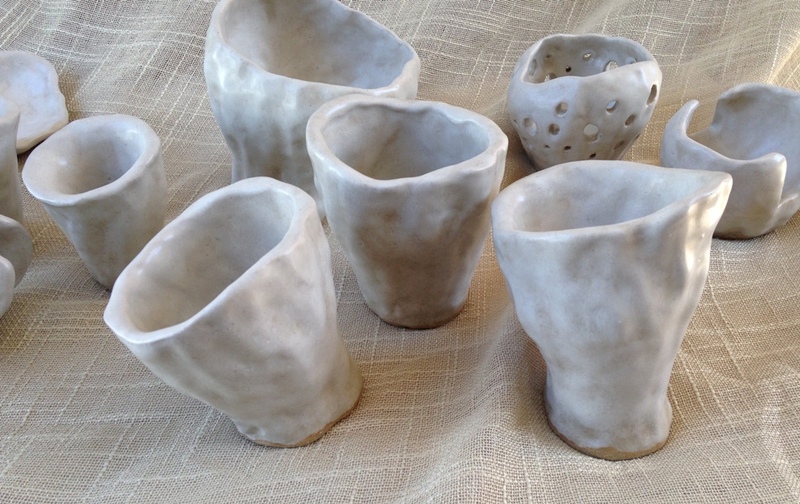 These are all completely free form pieces- I wasn’t quite sure what the final object would be and they all have a very organic ( and oceanic) look to them. 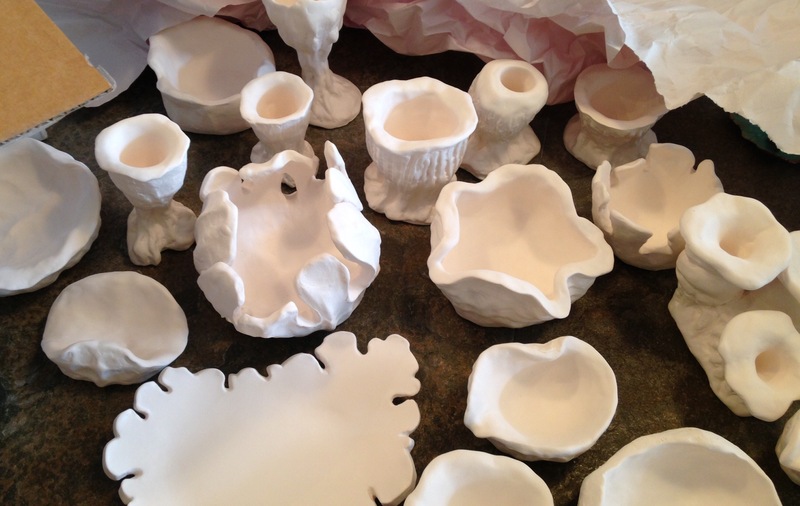 Next step – glazing. 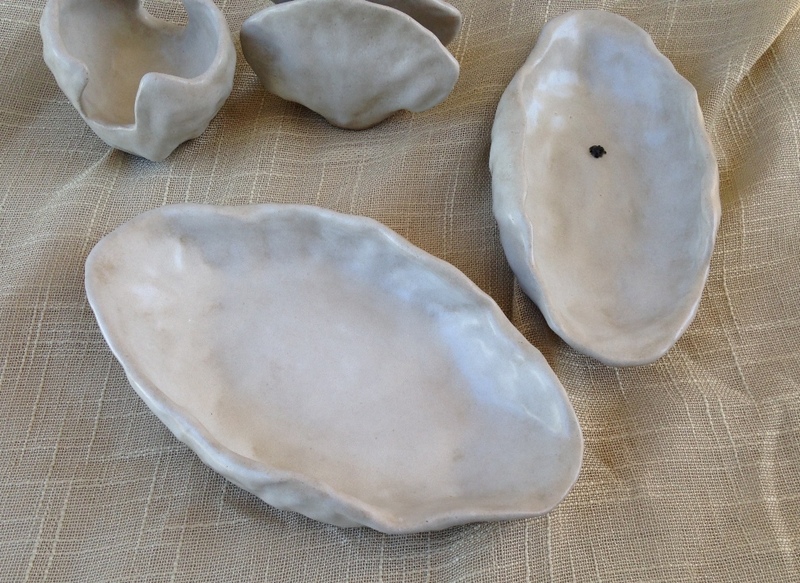 A variety of forms that could be bowls, vases, shot glasses and platters. 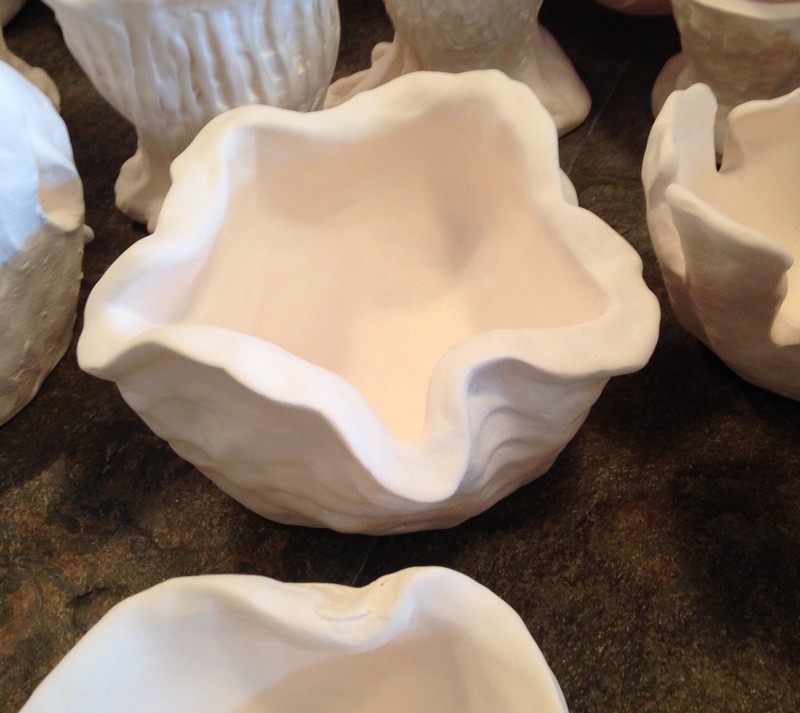 I was really wondering if this luminary would make it through the first firing.